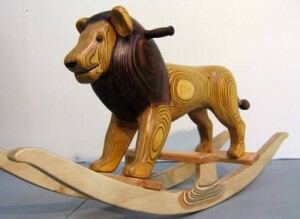 A New Zealand design based on the traditional rocking horse shape constructed in durable and attractive laminated plywood. 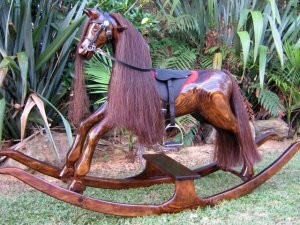 A modern style New Zealand designed rocking horse constructed in durable and attractive laminated plywood. Available in a range of sizes. 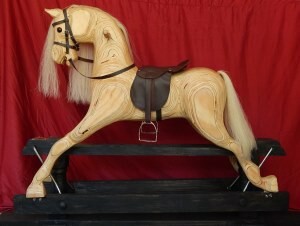 The same construction and design as the traditional English rocking horse. 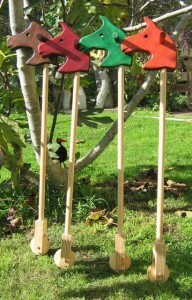 Made in a variety of timbers, including natives, with a selection of finishes. 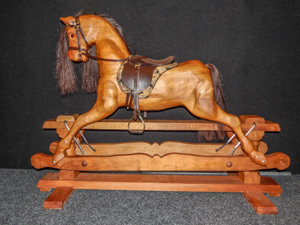 The rocking horse you have if you don’t want a horse. Choose from Zebras, Giraffes, Lions, Dragons, or maybe a rocking cow. We also take commissions to produce your own wild one. Our wooden hobby horses are designed for the active child, with a bit of imagination they can take it anywhere. 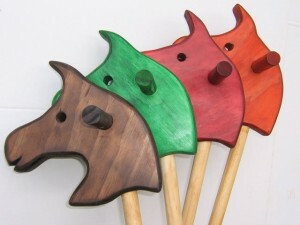 They are available in a range of colours, including natural, dark brown, tan, blue, red, orange or green. Each hobby horse is approximately 950mm long from the top of the ears to the ground, and the head is 200mm from the nose to the back of the head. Each hobby horse has a single wheel.